Oxford Ceiling Tiles is rated 5.0 out of 5 by 6. 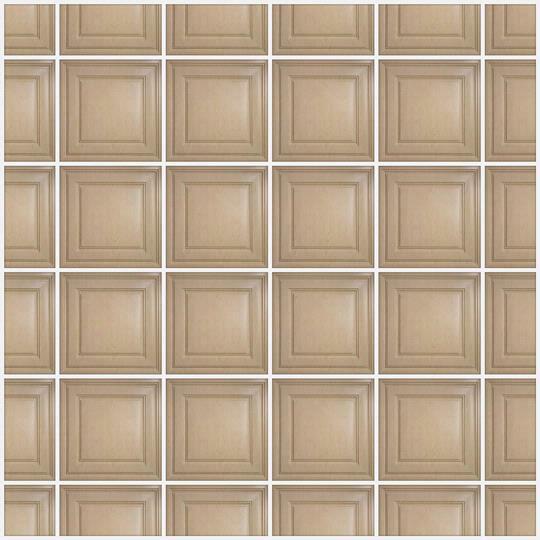 2 ft. x 2 ft. 2 ft. x 4 ft.
Oxford Ceiling Tiles are simple, but anything other than boring. 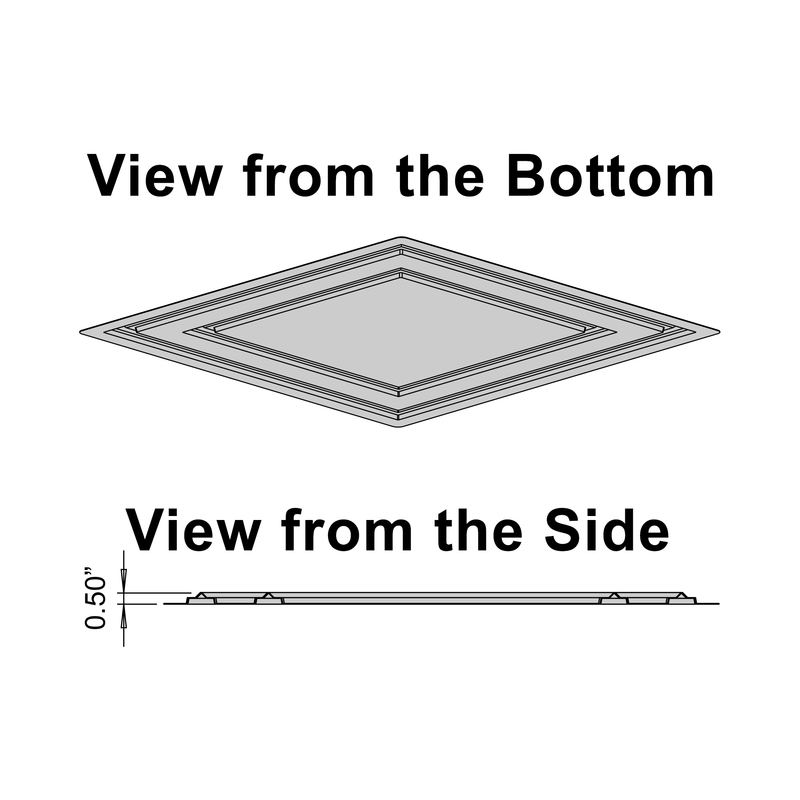 Their robust 0.030" thick construction makes them perfect for areas that require intricate trimming (like drop ceiling borders) or get extra wear and tear, and their elegant design is perfect anywhere! All of our Signature Series tiles are Class A fire rated, 100% recyclable, completely waterproof, Greenguard Gold Certified for indoor air quality, and made in the USA. 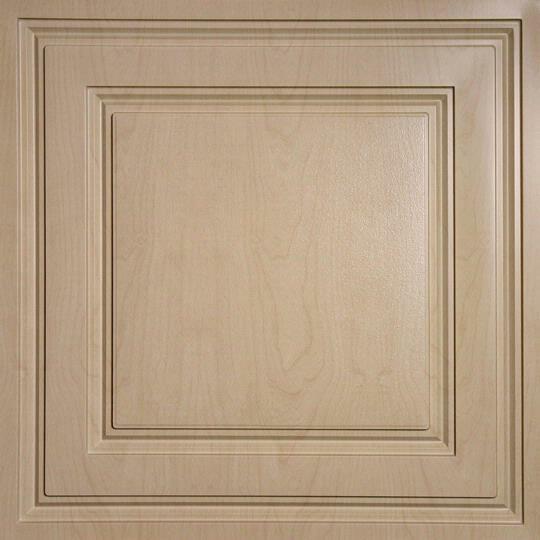 For the look of wood millwork, with the flexibility, durability, and versatility of vinyl - look no further! Is this the same as the Cambridge tile just flipped over? &nbsp;Can the Cambridge tile be flipped over to have the same look as the Oxford? &nbsp;Any issues installing the Cambridge this way? You are correct! The Oxford is an inverted Cambridge. Since the design of the Cambridge tile projects down from the ceiling, it can only be installed as a full 2x2 tile in a ceiling grid. Since most ceilings don't lay out to a perfect 2x2 grid, there are usually tiles around the perimeter of the room that must be cut. When you cut a Cambridge and try to install it in a ceiling grid, that downward facing design prevents the tile from sitting flush in the grid. Flipping the Cambridge over allows the tile to sit flush in the grid while continuing the &quot;square within a square' pattern and there are no issues with installing a Cambridge in this fashion. Flipping a cut Cambridge tile over works for our standard colors (white, sand, merlot, latte, and black) because those colored tiles are a uniform color on the front and back. But the Faux Metallic and Faux Wood finishes are only finished on one side. We've developed the Oxford for use as a border tile to the Cambridge in those 2 finish groups. Rated 5 out of 5 by mattsoj4305 from Easy to work with and looks great! Very easy to work with and looks great. One great tip I received when I called in with questions is using a hole saw in reverse to cut holes....worked great. It would be great if there was a place on the website with tips like this. The only thing I would warn people about is since the tiles are so thin they will not support any weight at all. This created some issues with my suspended ceiling project, specifically with lighting and HVAC. I was able to solve them; again, a tips page on the website may have helped. Especially for people who have never worked with ceiling tiles. At the end of the day, extremely happy with my choice of Ceilume tiles for my basement. Rated 5 out of 5 by Pat65 from Love my new ceiling. We recently remodeled our 1980s rec room. I was looking for a modern, light, bright ceiling tile with a design as well as durability, and ability to be cleaned. As we were also installing surround sound I was looking to keep the sound in the rec room rather than flowing throughout the entire house so I opted to purchase the insulation as well. The Oxford white ceiling tile and insulation was everything I wanted. The room looks beautiful and the sound stays in the rec room. Everyone who sees the new ceiling comments on how beautiful it looks. Rated 5 out of 5 by Robert Turelli from Your tiles were fantastic! Easy to order, easy to work with, easy to install, and, most important of all, they look beautiful! I rate them a 5. In the past, I have used Armstrong ceiling tiles, but I will never go back to them - your tiles are far superior in every respect. I have attached some photos of the finished basement. The family is really enjoying their new room. Keep your standards high and keep putting out an excellent product. Rated 5 out of 5 by Neha Arya from This is a beautiful, lightweight, durable, product. The finish on it is beautiful. You truly get a quality product. We went to a big box store which carried another brand, but the quality is nowhere close to this tile. The steps for installation is very simple. Even though my husband is a DIYer we still had a professional come in an install the tiles. Once the whole ceiling is done, I will post a follow up comment with the pictures of the ceiling. Rated 5 out of 5 by Lynne Szymanski from The Oxford ceiling tiles look awesome. It took a little bit of time to notch the border tiles to fit around the grids, but we chose to do that rather than flip them over because we liked the look. Sharp scissors are a must. Very easy to work with. customer service was super. Answered all our questions, and when we found ourselves short a couple tiles it was no problem to do an add on. Highly recommended. Rated 5 out of 5 by Scott Belanger from The tiles look great and would rate them a 5. The only suggestion I have is to find a good set of angled scissors to cut the tiles. Cutting with standard scissors was a little more difficult than I thought it would be. A cheaper version Lenox 22207 207 offset snip. Guiding Principle #6: Be unique. Stand out even in the most crowded marketplace.